I’ve come to the conclusion that all aspiring actors are nincompoops. Besides me, of course. On Saturday, August 21st, I had my first true encounter with showbiz. The local news anchors practically screamed, “OPEN CASTING CALL FOR HOLLYWOOD MOVIE DOWNTOWN!” which, to any town in Oklahoma, is the equivalent of hosting the Olympics. I took one look at the headline, and decided that this was my big break. As did 2,000 other people, darn them. I didn’t even know our population consisted of that many jerks. I’m not bitter. I swear. For some odd reason, I expect to be the only one that hears about these types of shindigs. So, I arrived at the swanky (by Oklahoma standards) hotel at 10:30, wearing my brand-new pinstripe suit. An older man stood just in front of me. He gestured towards the far-reaching line of aspiring movie stars. “Line to the bathroom,” he chuckled. The line stretched from the front of the hotel, around the side, into the parking garage, and finally inside the hotel. The sun beat down, but soon after my jacket was sufficiently sodden, we made it inside. “It won’t be long now!” was the thought that continued to play in my mind. For about six hours. Here’s a fun fact! Did you know it’s possible to stand for a mile? The only information anyone gave anyone about this film is the ambiguous synopsis: “A family-oriented romantic drama set in Oklahoma.” Oh, and there’s the tidbit that fishing is critical to the plot. Don’t ask me. I think the reason that there are so few casting calls in Oklahoma is that no one in Hollywood is quite sure whether or not this territory has been claimed yet. There were rumors that Ben Affleck, Rachel McAdams, Javier Bardem, Rachel Weisz, and Jennifer Garner would be starring. How do I know this? Well, believe it or not (on second thought, just believe it), I have been in talks to replace Ben as Rachel McAdams’s love interest. Rachel W. and Jen have also become cognizant of my magnetism, but theirs is simply a passing fancy. Rachel M. and I are true. You may be asking, “If you’re so tight with Rachel McAdams, why did you stand in line for six hours with the lowest level of beginners at an open casting call?” Stop ruining the fun, will you? Anyway, back to my story. So, after I had done my best impression of a stationary Vanna White, I finally reached the “magic room”. As the name implies, this room is where the magic happens. Sign a form! Take a picture! Leave! SHAZAAM! What is your blood type? What is your social security number? What do you do when no one’s looking? Hmm? Then came the dreaded clothes size questions. I have about the worst memory of anyone I can remember, so asking me to recite dimensions of my trousers… Anyway, after giving the bystanders a free show, I moved to the next table. You know what number I was? 949. I wasn’t discouraged! Nay, I was all the more empowered! Out of these 2,000-something inexperienced hopefuls, I am the breakout star! No, really, I was kinda disheartened. They took a few pictures, and I practically whispered a quip about how I had promised my mother I’d never have a front-on and profile picture taken of me solely for identification purposes. I was the only one to hear it. Or laugh at it. I walked out of the Magic Room with a heavy heart, until I was stopped by official-looking people in official-looking clothes. They spoke to me in official-sounding voices. Unlike me, they had the capability to refrain from making any racy joke regarding the latter sentence. Instead of getting me arrested, indecent exposure got me a part. Coming soon to a theater near you. Macabre humor, thy name is Hitchcock! It’s here! 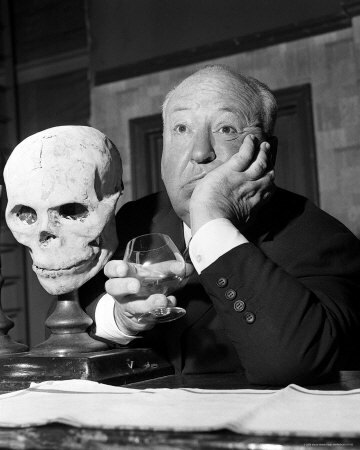 Today is the 111th birthday of the Master of Suspense, Sir Alfred Hitchcock. Perhaps the most influential and talented of all the Hollywood directors, Hitch got his start in silent films in England. His first completed directorial project was The Pleasure Garden (1925), and he went on to enjoy nearly fifty years of legendary status. He directed some of Hollywood’s (and England’s) greatest stars, including Cary Grant, James Stewart, Grace Kelly, Kim Novak, John Gielgud, Joan Fontaine, Laurence Olivier, Gregory Peck, Ingrid Bergman, Montgomery Clift, Karl Malden, Ray Milland, Paul Newman, and Sean Connery. Wow. His films are some of the most visually and mentally arresting films ever to come out of Hollywood. After making a small splash with his 1927 silent film, The Lodger, and fairly big splashes with Blackmail (1929), The Man Who Knew Too Much (1934), and The 39 Steps (1935), he made his first American film, Rebecca (1940), with famous Hollywood producer David O. Selznick. Many modern directors (including Martin Scorsese, M. Night Shyamalan, and Guillermo del Toro, just to name a few) give Hitchcock generous doses of credit for their inspiration. Hitch’s phenomenal films have thrilled (and continue to thrill) generations of viewers. Here was a man who constructed classy suspense. Check out my reviews of Rear Window (1954) and Psycho (1960). I promise to have many more Hitchcock reviews soon. Happy birthday, Sir Alfred, and rest in peace. The Harry Ransom Center in Austin, Texas, is planning to host a monumental Gone With the Wind exhibit in 2014, for the 75th(!) anniversary of the legendary film. Who’s comin’ with me? But YOU can help make this an unbelievable event. Sadly, the original costumes (five dresses worn by Vivien Leigh) are extremely fragile and cannot be exhibited at this point. They need funds to restore the dresses, to purchase quality protective housing (to allow them to be shipped to other museums), and to purchase custom-fitted mannequins so the dresses can be properly displayed. Hello, dear readers! I think another quick list is in order, don’t you? I am, of course, a lover of music. I listen to all kinds of music (well, most kinds, anyway) constantly. I truly don’t know if I could survive without it. To let you know where I’m coming from, my favorite singers include (but are certainly not limited to) Frank Sinatra, Bing Crosby, Tony Bennett, Perry Como, and Sam Cooke. The smooth, confident voices of jazz. After watching certain movies, I became cognizant of the hidden singing talents some actors possess. So, here it is, folks: Actors Who Should’ve Also Pursued Musical Careers. Now, don’t tell him, but I put dear ol’ Jerry at the bottom spot. I did this only because, well, he did pursue a musical career for a bit. It was short-lived, however, and I don’t think many of his recordings have survived. He had a carefree attitude in his musical performances which overpowered his slightly nasally singing voice. Take a look at this performance of That Old Black Magic from his 1963 film The Nutty Professor. If you were a kid or a parent in the ’80s or ’90s, you probably watched (at least once) An American Tail. You know, the one with the mice? 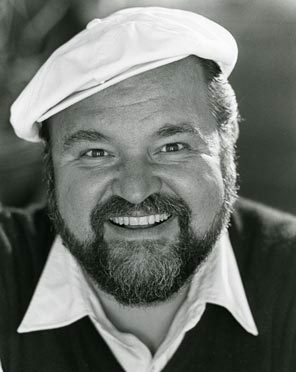 In this film, the lovable Dom DeLuise plays an even more lovable orange tabby named Tiger. And, if you’ve begun to recall any of the film by now, you probably remember that he shared a duet with Fievel, the picture’s tiny hero (who is NOT, in my opinion, musically inclined). I was rather surprised at how well DeLuise sang. Hear for yourself! In his hysterical Hitchcock parody, High Anxiety, Brooks sings the title song in a nightclub. His performance reminds one of Sinatra or Tony Bennett, but with a distinctively Brooksian(?) flair. His voice is definitely unique, and his performance is tongue-in-cheek. That rhymed! Roald Dahl’s imaginative masterpiece, Willy Wonka and the Chocolate Factory, is one of the most universally loved and cherished films ever made. Although Bonnie and Clyde and The Producers made Gene Wilder familiar with Hollywood, this film rocketed him to fame in the early ’70s. With the film’s most memorable song, Pure Imagination, Wilder gives us but a taste of his largely hidden singing talent. And aren’t we grateful! Today is the birthday of one of the most gifted, constantly hilarious comedians in Hollywood history. There cannot be enough said about this man, and I bet ya I won’t say anything that hasn’t been said before. He’s a wonderful entertainer, a great actor, a hilarious comedian, and an all-around likable guy. Period. He tragically passed only last year, but his art lives on in dozens of films and countless TV appearances. He was one of Mel Brooks’ stock company, with Madeline Kahn, Harvey Korman, Gene Wilder, Cloris Leachman, Marty Feldman, and Kenneth Mars… Possibly the greatest team of comedians ever. He was featured in Brooks’ Twelve Chairs, Blazing Saddles, Silent Movie, History of the World: Part I, and Robin Hood: Men in Tights, as well as many other films of equal or greater hilarity. We will always remember you, Mr. DeLuise. Happy birthday, and rest in peace.